Busking has been around for ages— but for those who aren’t familiar, it’s the act of publicly playing music in the hopes that people will give you some cash. I personally could never be a busker. First, I have zero musical talent, and second, I’m not really the best at taking rejection. 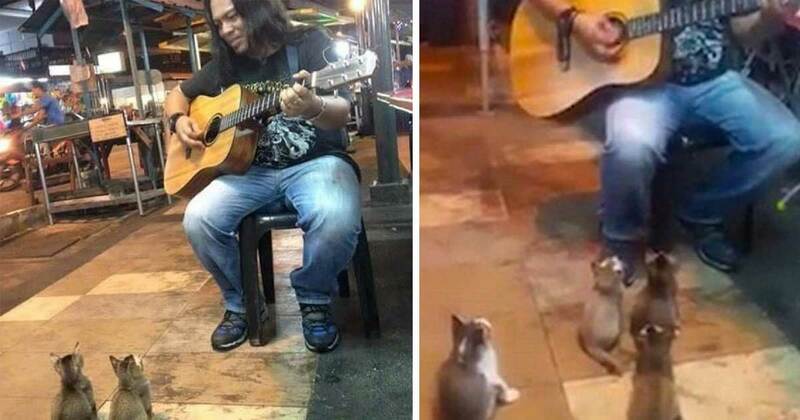 A Malaysian busker was feeling particularly rejected one night when he was busking and no one was paying any attention to him. The long-haired singer had been out with a friend, performing for what seemed like hours, and he was just about ready to call it quits. There was no point in wasting his time if nobody was going to appreciate his skills. Instead of packing up his stuff and leaving though, he decided to try one more song— and that’s when he got a little surprise. 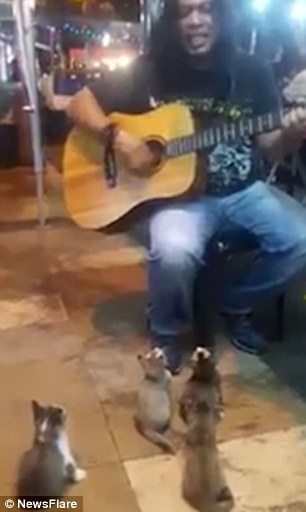 In the video, you see 4 three-month-old kittens walk up to the singer and plop themselves down to enjoy the show. The little kittens appear to be enthralled with the music. 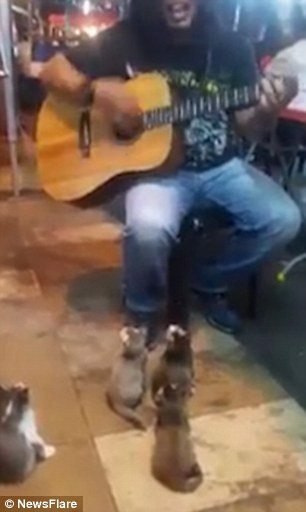 They sit in front of the busker, eyes tilted upwards, enjoying the man’s performance. At one point, their tiny heads even begin bobbing to the beat. The long-haired singer can’t seem to believe what is happening. He even starts laughing half-way through the performance in disbelief. According to researchers, cats are actually big fans of music— as long as it’s the right kind. For example, many cats shelters play classical music because of the calming effect it has been shown to have on felines. 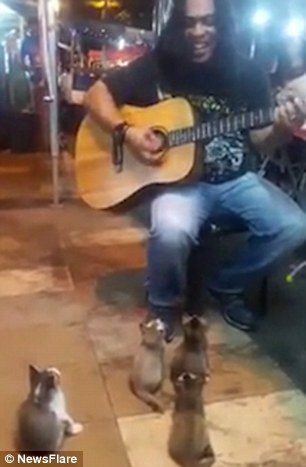 According to Pet Health Network, when kitties like a certain type of music, they will show their approval by either purring, moving their head towards, or moving towards wherever the sound is coming from— all behaviors seen from the 4 little kittens enjoying the busker’s show. 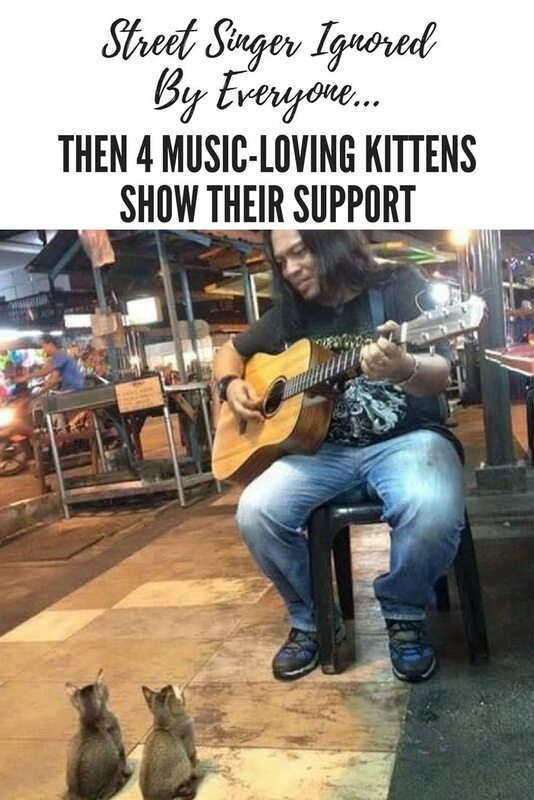 According to the singer’s friend, the kittens sat motionless until the end of the show, and the busker then thanked them for watching his performance. Watch the amazing footage for yourself below!